Pápai Páriz Ferenc, Album amicorum p. 435. Tantillum est, quô se Nobilissimo, Experientissimo, et suavissimae apud omnes memoriae Juveni Viro, D. Francisco Pariz Papai M. D. post aliquot, id est 15. Aristas regna sua videre atque mirari volenti, eôque fine Lugdunum transeunti commendare, eique omnigenam apprecari faelicitatem debebat, ac gestiebat. Symbolum Charitas aedificat. 1Cor. 8. 1. * Ps 39:13: Vulgate: “Domine, advena sum apud te et peregrinus sicut omnes patres mei”. * Neh 2:5: Vulgate: “si videtur regi bonum et si placet servus tuus ante faciem tuam ut mittas me in Iudaeam ad civitatem sepulchri patris mei et aedificabo eam”. – Those two words (“you” instead of “regi”, and “unto my fatherland” instead of “in Iudaeam”) with which the quotation was actualized, are underlined in the manuscript. In Leiden, on September 9, 1725. Motto: Charity aedifieth. 1Cor 8:1. 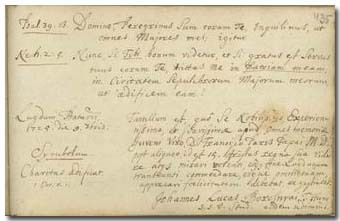 Borosnyai wrote in the album in 1725, in the last year of his studies in Leiden, indicating that he is also going to return home soon (eodem rediturus).